This paper presents results from an experimental program aimed at investigating the in-plane seismic behavior of thick perforated walls from existing earthen constructions. Two full-scale earthen wall specimens with dimensions of 7.0 × 3.45 × 0.6 m and door and window openings were subjected to cyclic lateral loads. Walls were made of adobe bricks and rammed earth (RE). The specimens were found to sustain a maximum drift of 0.46% only with distinctively different damage patterns that consist of few large cracks for the RE wall and a wide spread of cracking for the adobe wall. The RE wall had higher lateral load capacity and higher energy dissipation as compared to the adobe wall. Implementation of a simple retrofitting scheme consisting of vertical and horizontal timber straps along with post-tensioned rods proved to be very efficient after re-testing the damaged walls. Not only the initial lateral stiffness of each specimen was restored, but also the lateral load capacity increased by as much as 70% in both specimens. Most notably, the retrofitted walls had lateral deformation capacity five times bigger (2.5% drift) and dissipated almost 10 times the amount of hysteretic energy compared to the original specimens. 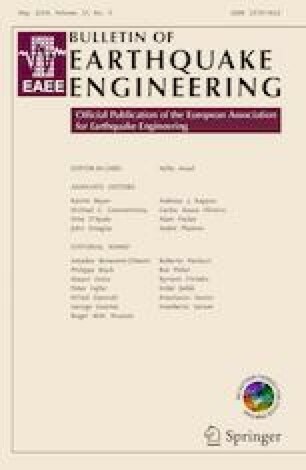 It was also found that a concrete damage plasticity model could be successfully calibrated to estimate the cyclic response of both original and retrofitted RE walls with a reasonable degree of accuracy, and thus highlighting the possibility for more generalized numerical models to investigate other earthen wall geometries and retrofitting alternatives. The authors are thankful to Santiago Rivero, Oscar R. Becerra, Ismael Santana, and to members of committee AIS-600 for serving as technical advisors during the execution of this research. This project was managed by the Asociación Colombiana de Ingeniería Sísmica (AIS) with financial support from the Dirección de Patrimonio del Ministerio de Cultura and the Instituto Distrital de Patrimonio Cultural. Christiam Angel is especially acknowledged for his dedicated assistance on the preparation of figures and formatting of the final manuscript.